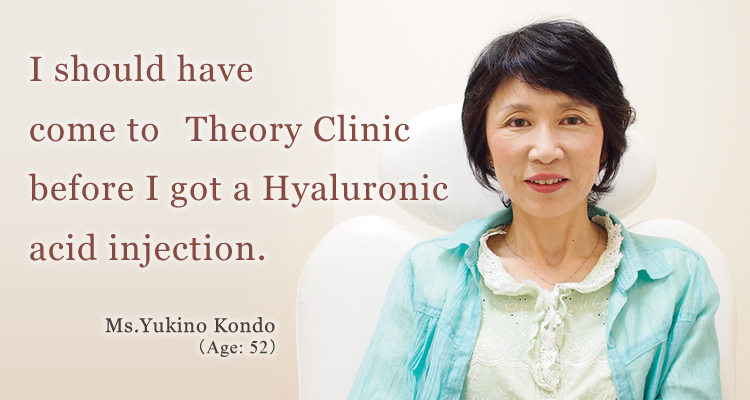 Ms.Yukino Kondo received eye bags treatment at Theory Clinic in December, 2013. ---It's been about three months after treatment. How do you feel now? I finally got rid of the problem that has bothered me for over seven years. So, I'm happy to see my face in a mirror everyday. Without eye bags, I think I look ten years younger. ---Any change in your lifestyle after treatment? I go out and socialize with people a lot more than before. Before treatment, I did not like going out at night because my eye bags were more noticeable with lighting. I feel good about myself now and I've become more active. I tried under eye muscle exercise for a while but it did not last. I also tried concealer to cover up the eye bags, but it did not work well. When I was forty-nine, I went to a famous cosmetic surgery clinic. ---What kind of treatment did you receive from the clinic? They recommended a fat removal surgery. But I was afraid of facial surgery. So, I chose Hyaluronic acid injection because I thought it was less risky. ---How did you feel after the injection? It made my skin surface more even, but I looked puffy. Since Hyaluronic acid gets absorbed into the skin, it was only effective for about six months. It was an expensive lesson for me to learn. ---What made you decide to receive treatment at your age? Every time I looked at my face in a mirror, I felt disturbed by my eye bags and I wanted to do something to get rid of them. I found Theory Clinic through searching on the Internet. I was interested due to its track record in eye bags treatment. When I met the doctor, he carefully explained to me why he did not recommend another Hyaluronic acid injection. He told me that I still had some Hyaluronic acid in my face from the previous injection and injecting more would make my face look puffier. Instead, he recommended that I should receive eye bags removal treatment. ---What did you think about the doctor's explanation? Everything was clear. I understood that there were different types of eye bags and treatment methods. I could tell that the doctor was making the best treatment plan for me. He explained about the treatment process, possible side effects, downtime and duration of the effects after treatment. I knew I made a right choice to come to Theory Clinic. But it took me about two months before I got over my fear and finally received treatment. ---Please tell us how you felt on the treatment day. Although I was prepared, I was still a little scared of removing fat with laser knife because the site is so close to my eyes. When the treatment was finished, I was surprised to see the amount of fat taken out. There were a few lumps as big as my thumb tips. The treated sites were slightly swollen, but I went home by train as usual. When I went back to work a couple of days later, I still had a slight swelling. It was gone after a week. I saw that my eye bags were also gone. ---Can you give any advice to the people who are wondering about eye bags treatment? Honestly, I had some uneasy feeling about the treatment. I think many people at my age are hesitant about making a big decision such as removing a physical complex by surgery. At Theory Clinic, the doctor and all the staff understood my feelings and helped me go through the whole process. It was easier than I thought. I'm totally satisfied with the result. I really appreciate that Dr. Tsutsui attentively took care of me throughout the treatment process. I would like to thank all the staff, too.